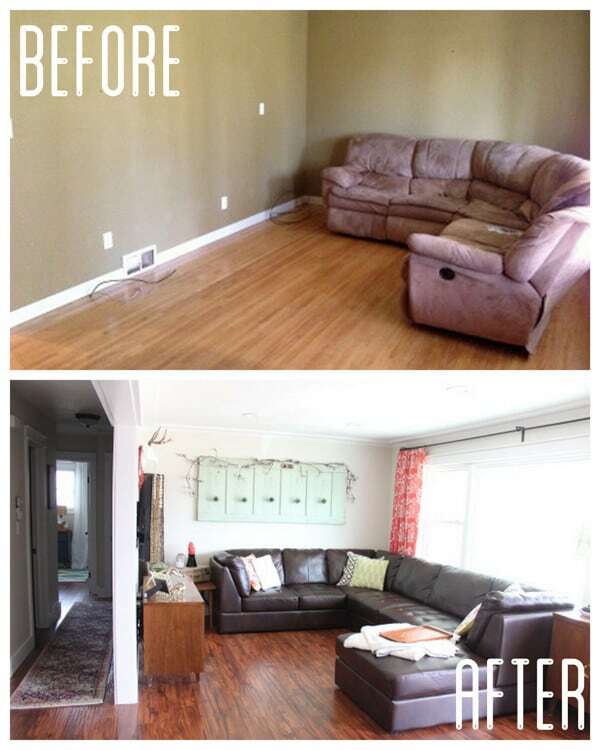 Today I’m sharing how we flipped our house to pay off our student loans. About two months ago I shared our exciting news, we sold our beloved auction house! Yes, the house that we bought just a short year and a half ago and poured our blood, sweat, and tears into. Although we loved it and thought we would stay there a long time, we decided to make the sacrifice so that we could pay off our student loans. Since selling the auction house, we’ve been busy at work with our current project, the “Retro Ranch Reno“. Before everyone has completely forgotten about the auction house though, I wanted to share: How we Flipped our House to Pay off our Student Loans. When we bought the auction house it needed quite a bit of updating and TLC. 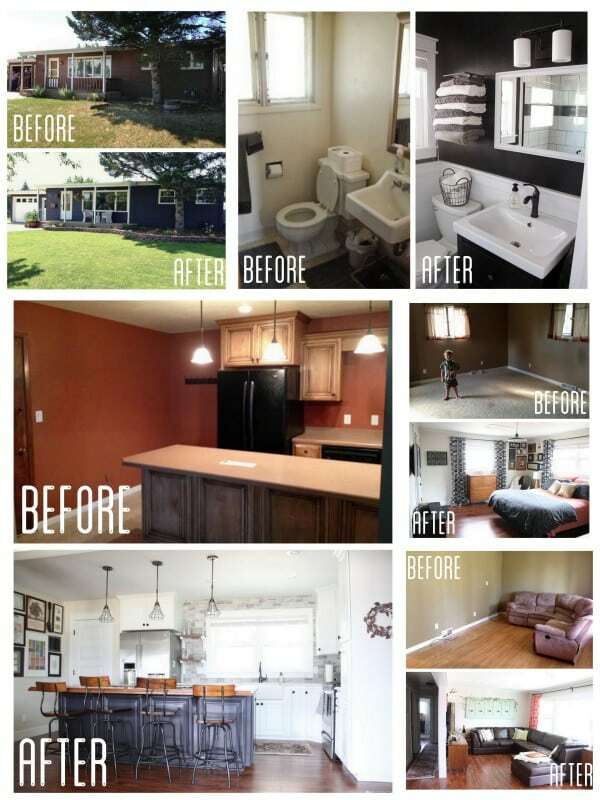 Here are our “Before & Afters”, along with what we did in each space. We started out with some major yard cleanup followed by even more yard progress. 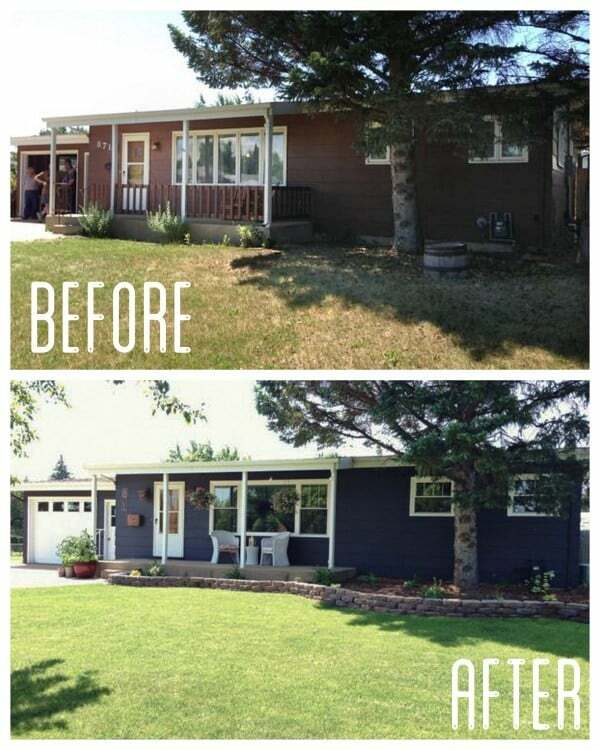 After getting the yard under control we got busy with a dark and moody paint update. Along with these changes we updated the house numbers and mailbox, and swapped out the front door and storm door. 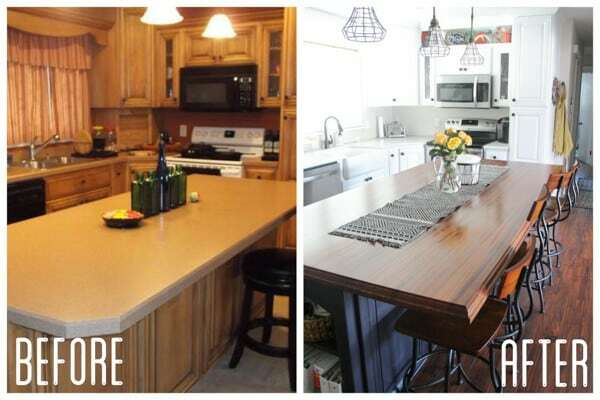 We did SO much work in the kitchen and turned it into a total showstopper. We started by making our DIY cage pendant lights. Then we built open shelving above the existing cabinets. 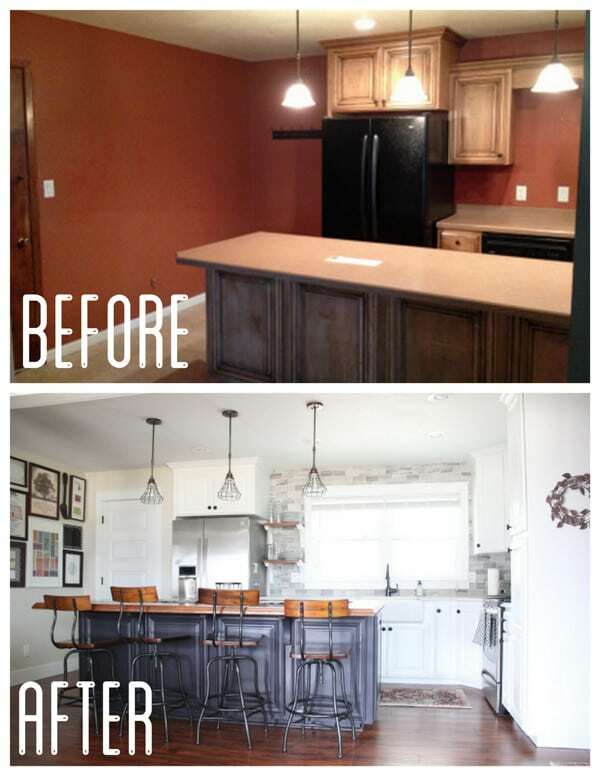 After that we painted the cabinets white and painted our two tone kitchen island. 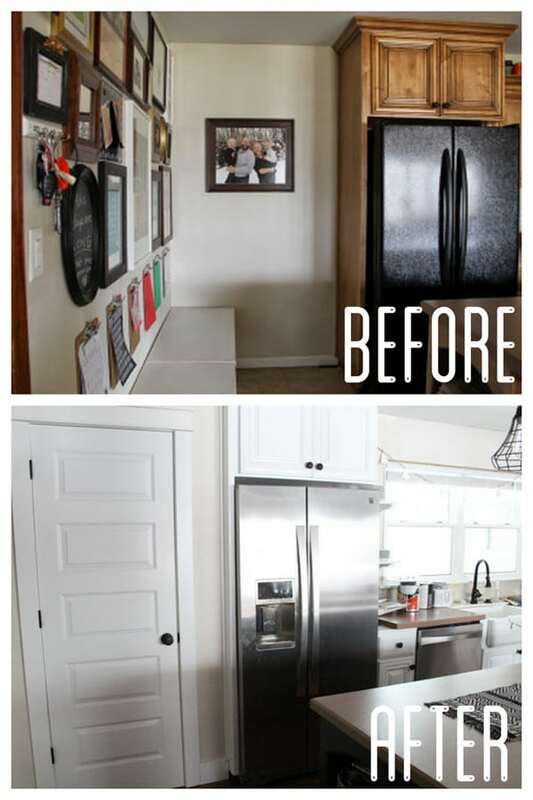 We also updated all of our appliances and built a pantry in the space next to the refrigerator. This house didn’t have a dining room, or even a dining space, so I had to get creative and make a dining space. In the end I revealed our makeshift dining space which was almost as good as any eat in kitchen! In the living room we started by opening up the wall between the kitchen and living room. Then we just painted and laid new laminate flooring. I finished it all off by hanging my DIY no sew pinch pleat curtains. Along with laying laminate flooring throughout the house, the master bedroom was mainly taken care of with new windows and some paint. I did build the DIY affordable barn door hardware, as well as hang a vintage copycat industrial light. 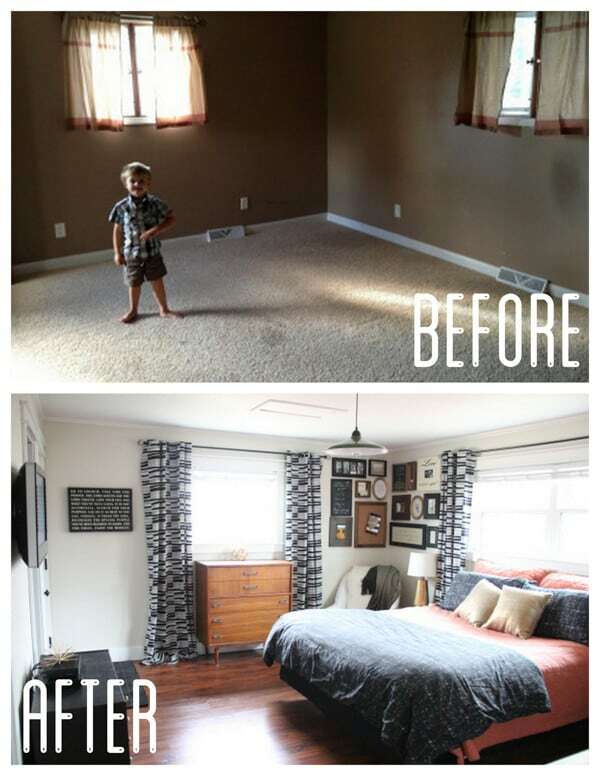 I did the Vintage Modern Boys Room Reveal near the end our of time in this house. 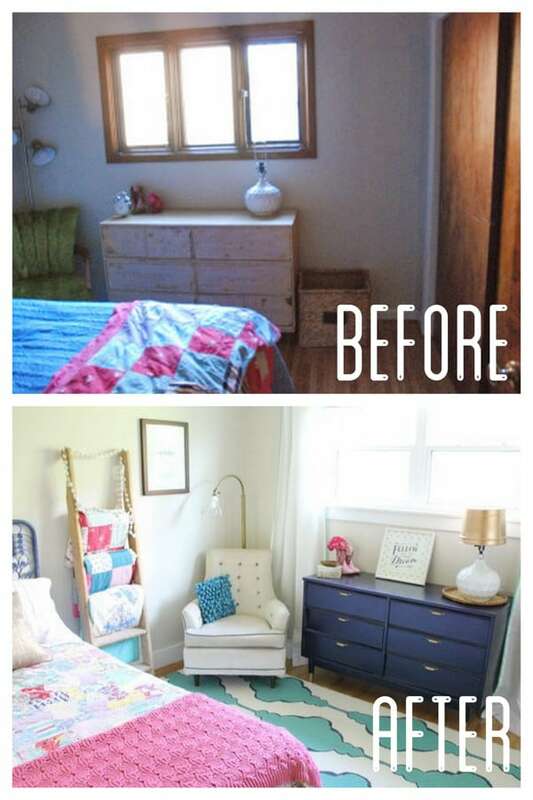 It included a vintage inspired kid’s book shelf and a DIY vintage metal cage light. I absolutely loved the charm and character in the boys room. 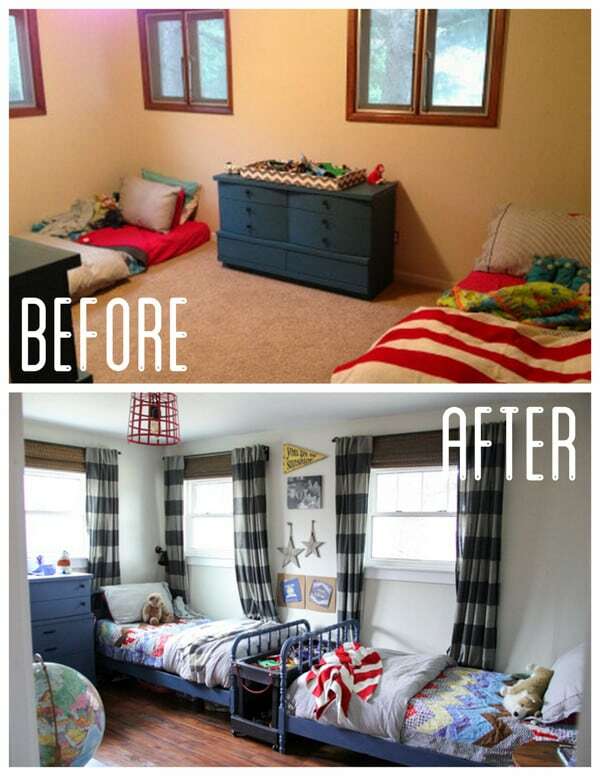 When we bought this house we had to do a lot of work to straighten out the funky closet construction in this room. 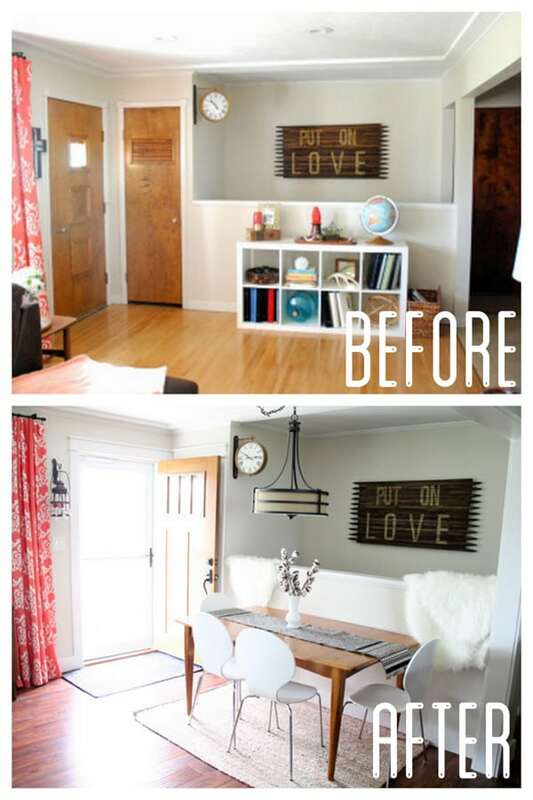 After that it was just paint and decor that made this room so adorable. 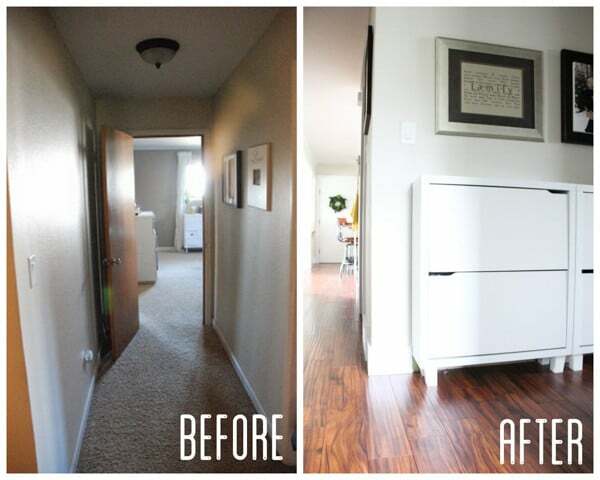 Replacing all of the flooring transformed this hallway, but then we added our shoe storage solution to add function. I started out planning a mood board for the modern industrial bathroom. 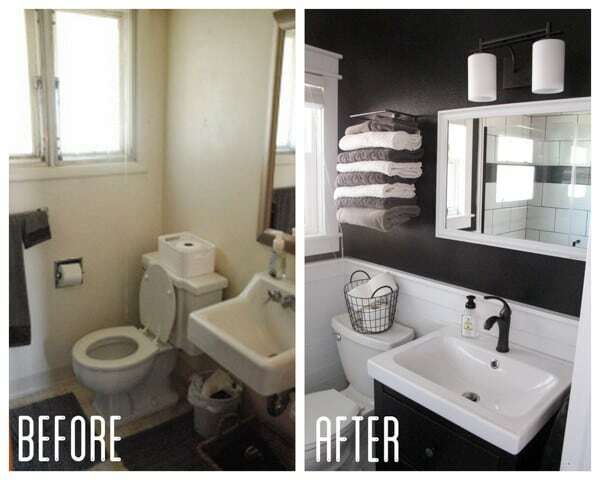 Then I shared our bathroom progress, our black and planked bathroom walls. Then I shared it all in the Industrial Modern Bathroom Reveal post. Even though this bathroom was tiny I loved every inch of it. 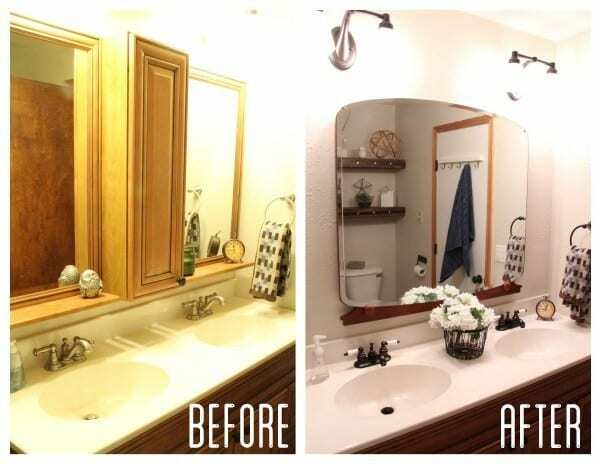 In the hall bath I just did a few affordable vintage updates to our builder basic bathroom. I also built our DIY Industrial Floating Shelves with Faux Rivets. When I look back at all the details and all of our hard work, I can’t help but feel a twinge of missing it. But… I know that we’ll be able to make something just as great out of our Retro Ranch. 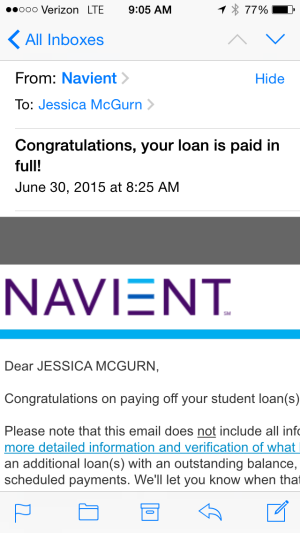 All of that regret also went away instantly when I got this e-mail, saying we no longer had any student loans! It made the entire flip totally worth it. 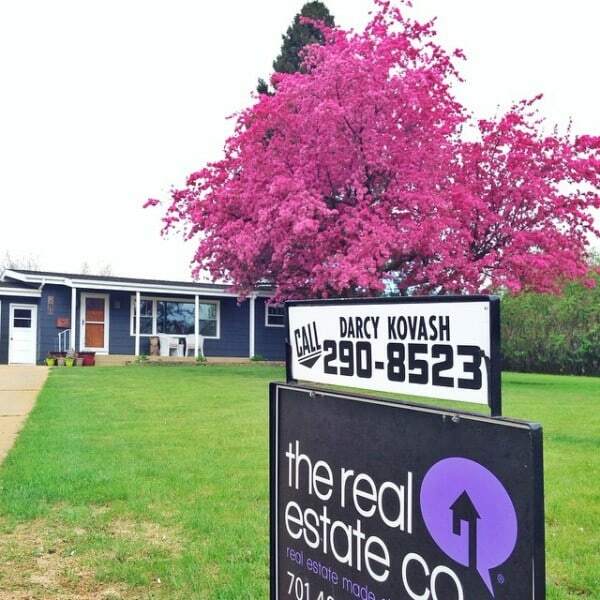 If you want to see all of the projects from this house check out the project gallery, otherwise if you’d like to see the first house that we flipped you can see the home tour here! Wow, this is so close to my heart. My husband and I really want to do this to pay off our crippling student loan debt. This gives me hope. Navient has my loans too. How do you get money to renovate the house when you have student loan debt? That’s always my question. Like who would loan us money when we already have so much debt?! So glad to see you were successful. This is #goals for me and it makes me feel better that you have kids too and you still made it work! Gives me hope!!! I’m so glad that I can be an encouragement. While we were living there we used every extra penny that we had for the renovations. By paying cash for each project, we were able to build a ton of equity fast. Once it was all done it was hard to part with, but knocking out our huge debts made it worth it. Good luck to you! I hope I can continue to inspire!